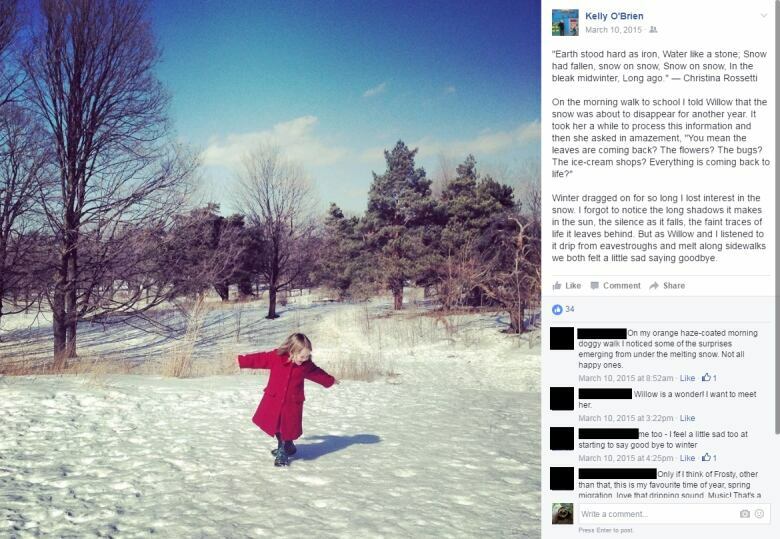 As a mother of three small children, Toronto filmmaker Kelly O'Brien was desperate for a creative outlet — but now she shares photo essays every day using Facebook. It didn't have to be Facebook. 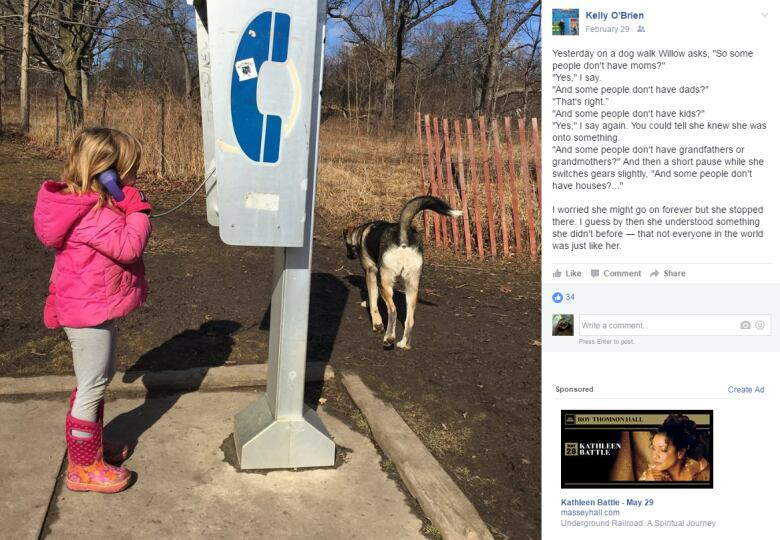 Kelly O'Brien could have gone with Twitter or Instagram, or just blissfully ignored social media altogether. But it's Facebook that the Toronto filmmaker signed up for in 2009, the world's most ubiquitous tool for spamming friends with photos, inspirational quotes and baby pictures. 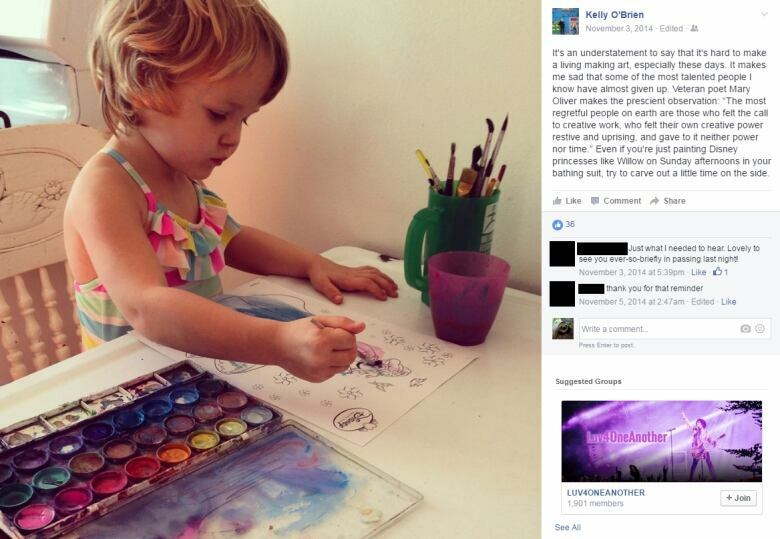 O'Brien does all that stuff too, but she also uses Facebook to make art. For those who aren't among O'Brien's closed circle of friends, she lifted the privacy settings IRL last month by debuting her work at the Images Festival in Toronto, stitching together several years of updates for a performance called Postings from Home. An old-fashioned slideshow on the surface, with O'Brien's serene voice narrating while her husband clicks through shots of their three young kids — Emma, Teddy and Willow — the performance is an impressionistic memoir. Using the ephemera typically shared on Facebook as a starting point (a beautiful snapshot, a bit of toddler wisdom), O'Brien weaves in her own thoughtful and deeply private observations, adding quotes from other artists to produce a constantly evolving essay about how we're all connected to family, to nature, to one another. "In 2007 after my second child was born with severe disabilities, it was impossible to go back to TV work," O'Brien tells CBC Arts. "The hours were just too long and I needed to be there for my son, Teddy." A filmmaker and former TV producer, "it's not like I wasn't creative before motherhood," she explains, "but I would have to say that the experience of having children has enriched and inspired my creative life in ways that constantly surprise and inspire me." At first, she went back to school in search of an outlet, ultimately getting her MFA in film and producing a personal piece about raising her son called "Softening." "Most days it was too hard to make that film, it took a certain distance that grief doesn't give you," O'Brien recalls, but just because the moment wasn't right to keep filmmaking didn't mean she was going to stop telling her story. "Making that film renewed my interest in making art about everyday life," she says, something she was already doing without realizing it. "I must have been desperate to make something, anything! 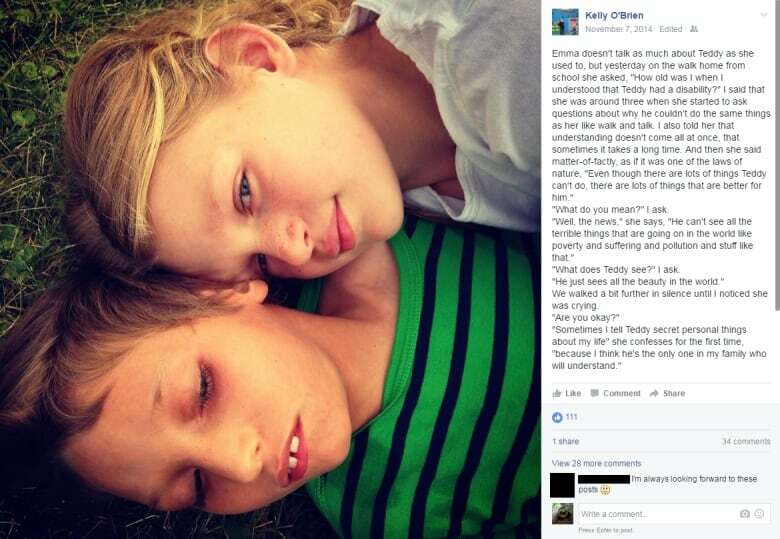 I liked the immediacy of Facebook," says O'Brien, who by this time had a third child, daughter Willow. She made a habit of posting, but with a conscious focus. 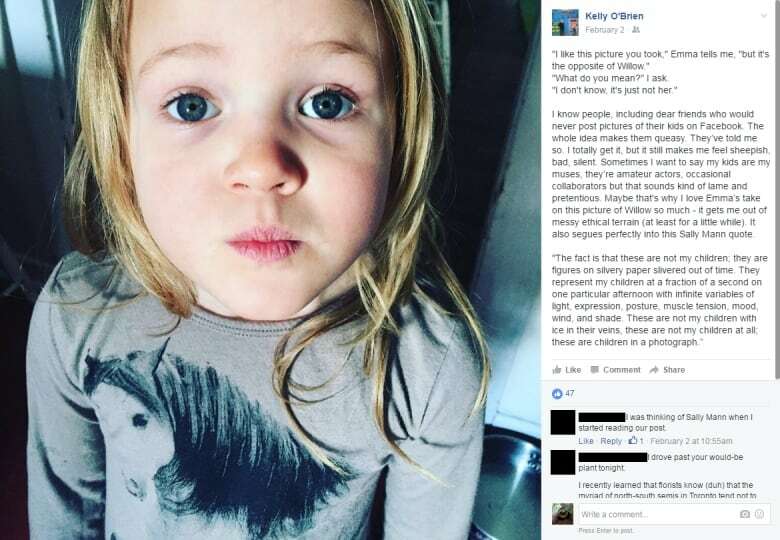 "I wanted the posts to be more than cute kid pictures. I wanted to share something meaningful that was bigger than me and my kids," she says, an approach that might come naturally because of her background making documentaries. "I never referred to it as an art project. It was more of a daily experiment, a way to make sense of what was happening around me, share a little beauty, some poignant bits of conversation." It's only because of her friends that O'Brien transformed project into a performance, something she tested last summer at a weekly arts event hosted by her friend, experimental filmmaker Mike Hoolboom. Ultimately, she says the thoughts she's developing daily on Facebook — a project she describes as "a sketchbook of my life" — will evolve into a film. 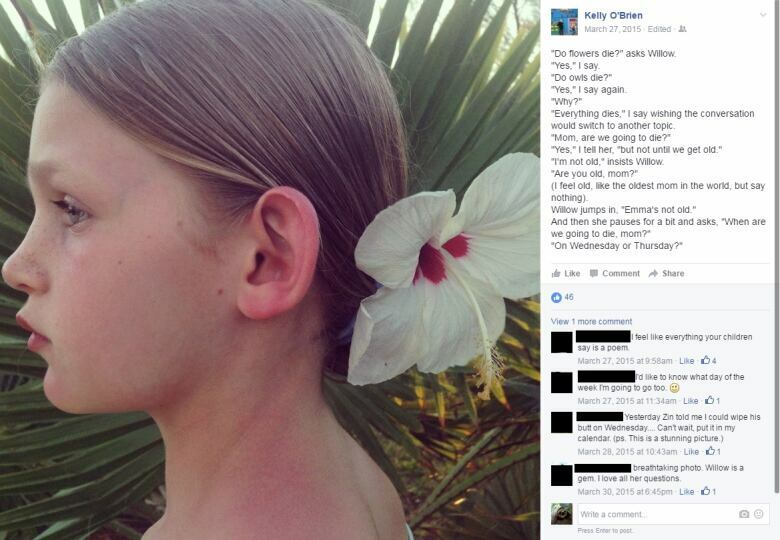 "This Facebook project has had some interesting side effects," she says. "I notice the world around me more. I pay more attention to things my kids, friends and strangers say. I look for nature in the city in ways that I didn't before. Facebook has given me a creative life that I never could've anticipated. It's been like my art school. I'm sure there's a group of people out there who are doing exactly the same thing as I am, I just haven't met them yet."